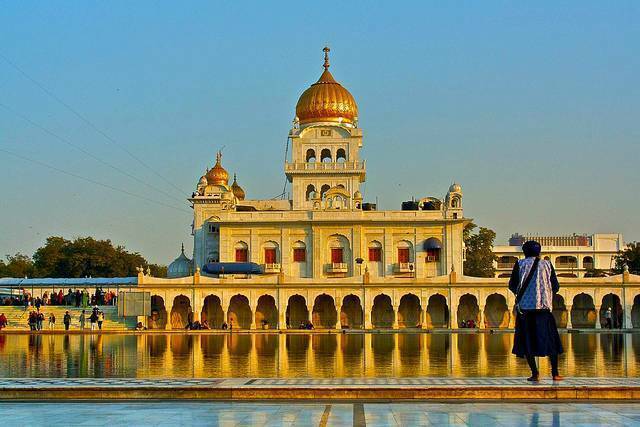 The most eminent Gurudwara for Sikhs, Gurudwara Bangla Sahib is located in Connaught Palace area of Delhi. This Shrine is one among nine Gurudwaras which were built in Delhi in 17th century under the supervision of Sardar Bhagel Singh, a Sikh General in the time period of Mughal rule in Delhi. This shrine is linked up with 8th Sikh Guru, called Guru Har Krishan. In 17th century, Gurudwara Bangla Sahib was mere Palace which belonged to Raja Jai Singh. The area where this Palace was located is termed as “Jaisingh Pura” (now, Connaught Place area). The striking feature of Gurudwara Bangla Sahib is its golden dome and tall flag mast called Nishan Sahib. Inside the complex, there is a huge pool called sarovar and its water is considered as Amrit by Sikhs. Beside the shrine, the building includes kitchen hall, Langar Hall (were food are served free to all people irrespective of race and religion), a school and art gallery. Visitors must cover their Hair with Scarves and should remove the footwear before entering the shrine. Cover your head while entering in the Gurudwara. Please make sure you are dressed appropriately for this place of worship.